Stop and Smell the Chocolates: Would You Like Chocolate With That? 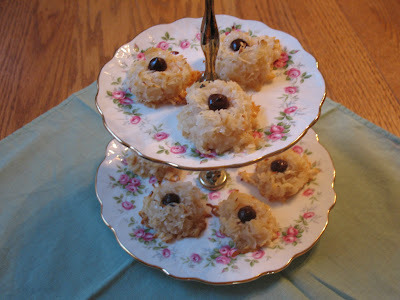 ~ Chocolate-Coconut "Cookies"
Would You Like Chocolate With That? 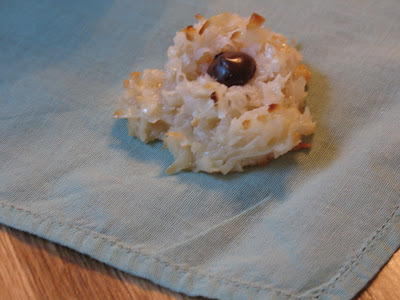 ~ Chocolate-Coconut "Cookies"
It's Friday - time for chocolate again! I just discovered this recipe in a Pam Anderson cookbook of mine. The recipe is an easy one, which I know you appreciate. I love coconut so I knew I would like it. These cookies are really sweet, but that means I don't need to eat as many - a good thing. The recipe calls for chocolate chips - you might want to use Nestle Chocolatier dark chips or Ghiradelli dark chips as they are bigger than regular chocolate chips. Or use 2 regular chocolate chips per cookie. Adjust oven racks to lower-middle and upper-middle positions and heat oven to 350 degrees F. Line 2 cookie sheets with foil and spray with vegetable cooking spray, or line with silicone mats. Mix coconut, condensed milk, and vanilla in a medium bowl. Using a 2-tablespoon measure ( a standard coffee scoop works well; I used a Pampered Chef cookie scoop), drop coconut mixture onto cookie sheets and top each with a chocolate chip. Now it's your turn! Please share a little chocolate today and link up below. You can create a new post or find one in your archives with a family-friendly chocolate theme. It can be a recipe, idea, favorite kind of chocolate, photo, poem, etc. Can't wait to see what you've got! You can link up anytime today. Um those sound delicious! I love coconut! And of course chocolate! Ok, I am going to try and do this per your instructions. Let's see how well I can follow your instructions.....????? Now I go to my site and post the recipe? Hope so!! And I tell them about you right? Ok, let's keep our fingers crossed!!!! I DID IT!!!! I just checked it and I did it. Hip Hip Hooray for me!!!!! (and you) thanks for talking me through it!!! Oh boy, I have learned another new thing. singing...I feel good uh hu, I feel good. These look good! And they're easy enough for me to make LOL! I posted a link to a recipe for Chocolate Pudding Cake - mmmm, good!